I write this blog post from a computer with a broken left shift key, so if I miss some capitalization, it is because that is the shift key I always use, so I am having to retrain my muscle memory for this post. It has been a few months since I posted, but a lot has been going on. I am, in fact, now a full-fledged instructor at Summit Point Motorsports Park for their Friday at the Track program and have another event coming up on May 2nd instructing there. My first time out as a solo-instructor was a great experience, but due to the number of instructors we had compared to the number of students, I only had 1 student that day. I also gave him a very interesting drive during the afternoon instructor session where I almost spun the car in turn 4 thanks to some remaining wet spots on the track. My next mission track-wise is to try and get certified as an instructor with TrackDaze because I really enjoyed instructing AND you get free track time when you do. This weekend, I just went out to expand my list of tracks I have visited with an event at Pittsburgh International Race Complex (formerly BeaveRun). It was a hike to get up there, but it was a fun smaller track. I registered for group 2 right off the bat due to my experience on track, but I still had to start the day with an instructor. Well, I was first to grid up but me and the guy behind me ended up without instructors. After waiting ~10 minutes, they finally tracked down another instructor and I was able to get on the track. They made up for my lost time by letting me go out in one of the Group 1 sessions later as well, but that was a painful experience due to the low speeds and drivers who were COMPLETELY lost on the race track. After that first run, I was cleared by the instructor to go solo there and had a blast the rest of the day. The Lotus in group 2 ALMOST lost it in front of me dropping 1 tire off in the mud before a turn but he managed to save it. My fastest lap (but fractions of a second) was actually in the second group 2 session rather than the 3rd, but the times on my laps not affected by traffic were very consistent in he 1:17-1:18 range. All in all, I am glad I went up there to try it and will probably go back at least once when they open the second track at the facility, but the drive means a hotel is required, and I have to go near Pittsburgh. The track really could use a repave though as can be seen by how bumpy the footage gets, especially on the back stretch. I also was looking for an event in Florida when we would be down there for Christmas and couldn't find one, but did see an event on the 24-hour course layout at Daytona International at the beginning of November with NASA....umm...yes, please! So I am registered for that, and will hopefully have the truck up and running again by then and can get my hands on a trailer. So, my upcoming schedule includes a Friday at the Track and TrackDaze event at Summit Point in early and mid May, and from there, it is mostly just instructing at FATT on my schedule for the next couple of months. I will try to post a bit more often as I progress through instructing more. Oh, another note. I am using Harry's Lap Timer as my data recording source with a Bluetooth OBD-II dongle and combining that with footage from my GoPros in DashWare to make videos with cool overlays like are in the below video. Ok, really, last note. 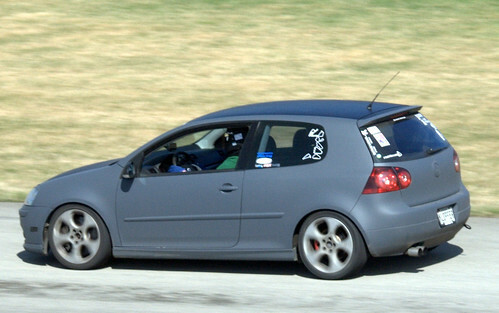 you will notice that the Rabbit is now matte grey with black roof and center line of the hood. I covered it in plasti-dip in my garage, and that was the result. I need to do some rework on the plasti-dip though.